Plastics are generally tough, corrosion and chemical resistant, lightweight, easy to fabricate, and less expensive when compared to alternative materials like metal. As with any manufacturing material, there are advantages and disadvantages to the different properties each material might have. Although there are many impact resistant plastics to choose from, there are a few that excel in their respective applications. Below we discuss the potential for three of the most common impact resistant plastics. 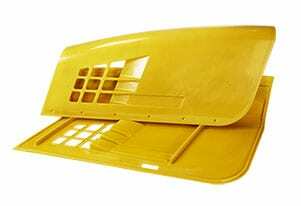 ABS (acrylonitrile butadiene styrene) is a widely used thermoplastic polymer found in everything from the popular Lego® toys to automotive parts. The heat at which ABS plastic is molded affects its final properties, with low temperatures yielding more impact resistance and high temperatures yielding more ultimate heat resistance. Polycarbonate plastic is a thermoplastic polymer that can be made to be completely translucent (like glass). Because of its ability to be made in grades that are see-through, this plastic is commonly used as a less brittle glass alternative. Unlike ABS and polycarbonate, pDCPD is a thermoset plastic (see the differences between thermoplastics and thermosetting plastics) which makes it structurally more resistant to extreme temperatures. Products made with thermoset plastics are also subject to a different manufacturing process, which has made pDCPD molding an increasingly popular choice for products that require the best corrosion, heat, and impact resistance.